A simple engraved central band framed in open scallops covers the face of this antique style wedding band. 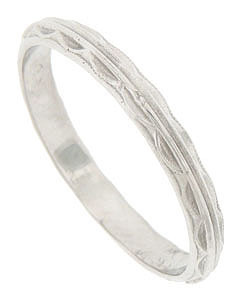 The platinum wedding ring is made from the original antique ring and measures 2.50 mm in width. Size 5 3/4. We can re-size slightly. We are currently stocking this ring in 14K white gold as well.